Confined space toilet hire is perfect for those small spaces. Construction sites, high-rise construction sites, restricted spaces and home DIY projects all benefit from confined space toilet hire. The confined space toilet hire is installed by one person and easily re-located by two people, they can be serviced weekly or just hired for a day or longer period. 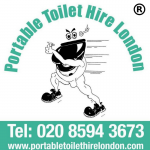 Please contact our dedicated team at Portable Toilet Hire London to discuss your toilet hire requirements for your construction site and we'll ensure you have all the information to hand for you to book your portable toilet hire. The modular toilets are delivered to your location in London, Essex and the surrounding areas.